Latias <Prism> is a Basic Dragon Pokemon, 130 HP, with a Fairy Weakness, no Resistance, and a Retreat Cost of 1. She’s only got one attack, Dreamy Mist, a 1-for-30 that lets you attach a Basic Energy card to each of your Basic Benched Dragon Pokemon. This kind of effect isn’t anything new, we’ve seen some moves that attach Energy from the discard pile to Benched Pokemon – there are even some Abilities that do the same thing! But there aren’t too many on the scale that Latias <Prism> does it. You could be attaching upwards of 5 Energy to 5 different Benched Pokemon – that’s 1 Energy per Pokemon, mind you. So in theory, this sounds like an amazing bit of set-up! And it is…for the later part of the game. In the early game, Latias <Prism> doesn’t do a whole lot, since it only grabs Energy from the discard pile. This sort of weakness is inherent in a lot of Pokemon with this type of move, but you’ll note that some major differences are that 1) those Pokemon tend to have Abilities, meaning they don’t take up your attack for the turn, and 2) you can run multiple copies of those cards, unlike <Prism> cards. If we had stuff like Sycamore or Battle Compressor in the format, then this kind of move is super-effective, but in Standard, they lack a lot of the tools that could effectively fuel the discard pile. There is at least one Pokemon that ends up milling your own deck to provide some level of benefit, but it only does it for one card, and if you’re not careful and don’t have Latias <Prism> in your hand or in play already, you could end up milling it out through that effect. It’s tough to evaluate Latias <Prism>’s effectiveness as a result. It’s not that Latias <Prism> is a bad card by any means – far from it, given the simplicity of her effect! But there’s a lot to consider with it being a one-of piece of the puzzle. Fortunately though, there are a lot of ways that Standard has recently acquired to be able to search out Latias <Prism> with ease, so it’s just a matter of figuring out how to put cards in the discard pile, which once that’s solved, Latias <Prism> becomes a powerful force in Dragon decks. Not to mention the small Dragon-themed subset to come out soon! Arora Notealus: Latias <Prism> has a lot of untapped potential, but having lost some of the most effective tools to make her impactful, it’s hard to see just yet whether Latias <Prism> will be a huge boon for Dragon decks or if it’ll fall flat. It’d be nice to see Dragons come out on top though – be a nice shift in the game! 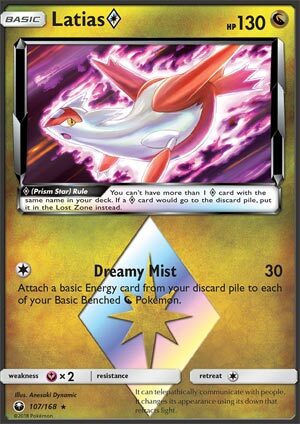 Next Time: And now for one of the cards that could actually make Latias <Prism> very very good! Latias Prism Star has one attack that is enough to secure the seventh best card of the set. Dreamy Mist does 30 for C, and also puts a Basic Energy card to EACH of your dragon Pokémon! This could be potent assuming you actually have that many energy cards in the discard pile and that many dragon Pokémon in play. However, despite Latias having a good 30 for 1 strike, it doesn’t hit any Pokemon for weakness. It is also a Prism Star Card, so you can only have one of them with the same name in your deck, making it harder to draw into outside of Lisia. Also, if you get too many energy back, Frost Rotom can punish your Pokemon for setting up. Overall, it’s a good card, but don’t compromise your cards and actions just to maximize the potential of this attack. Latias Prism (CES 107) seemed like it would pair beautifully with Rayquaza GX when we first learned of it during the early previews for Celestial Storm. I failed to pull one, and I decided against spending a full pack for a Prism card that I could probably get for a lot less than that a week or two after the set’s initial drop. I haven’t missed this card at all. Actually, I much prefer Energy Recycler since I can so frequently get two Vikavolts on the bench. If I use Latias Prism, that’s just a turn that I can’t spend inflicting insane amounts of damage on my opponent. In fairness, like I said, I haven’t actually tried it yet, and I probably will at some point, but for right now my Rayquaza GX builds are all sans Latias Prism. I originally had this as my ninth best card, but I would definitely drop it several notches at this point. Perhaps a year from now when Vikavolt is rotating out of the Standard format, but today there are many other cards I would include in this deck before Latias Prism.